Yoshi's Island: Super Mario World 2 (スーパーマリオ　ヨッシーアイランド, Suupaa Mario Yosshii Airando? 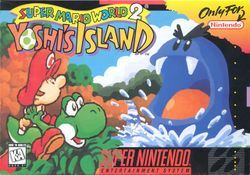 ), often referred to as Yoshi's Island, released as Super Mario: Yoshi Island in Japan, and Yoshi's Island: Super Mario Advance 3 on the Game Boy Advance) is a platform game by Nintendo for the SNES. While featuring Nintendo's trademark Mario character, the game's innovative graphics and gameplay differed from all previous Mario platformers in that players control various Yoshi dinosaurs rather than Mario himself, who appears as a helpless infant. The Game Boy Advance version contains new features, including six brand new levels, and a battle mode homage to the original Mario Bros. (which was included in every single version of Super Mario Advance). This page was last edited on 10 February 2016, at 21:48. This page has been accessed 34,802 times.